These will be dry bulbs at this point of the year and can be re-spaced between August and October into a larger planting for next year. In cooler climates (if the quality is still good) the tops/greens/leaves of Egyptian onions and perennial leeks can be cut and used fresh. 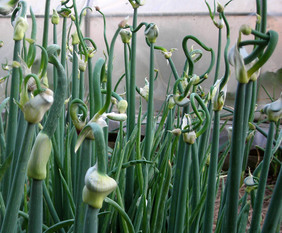 The larger bulbils of Egyptian onions and perennial leeks can be used in mixed pickles. Garlic and bulb onions can be eaten from storage. Early August: at the third sorting of the potato onions, I separate the clusters, trim the tops and sort by size. Sorting by size is not essential, but I do it to help me figure out what to save for planting and what to eat or use as seed (for planting). We sort smalls (<1.5”), larges (1.5-2.0”) and eaters (>2.0”). And compost material. The rack space required after this stage is only a third of what it was before that. At the end of August I sort through again, and make initial plans about what to do with surplus planting stock (sell, give to friends). At the end of September I make the decision about how much to keep back for planting. I used to put the onions into net bags for storage, but I found I get better results if I just leave them in a single layer on the racks. The small ones stay there till late January, through freezing conditions (or more accurately, alternating freezing and thawing conditions). They can appear to be frozen solid, but are in fine condition. Ideal conditions are 32-40F, 60-70% humidity, with good ventilation. Layers should not be more than 4” deep. Seed saving is a natural part of growing potato onions. We started in 2000 with 0.5 pound of seed stock, planted late in the spring. We harvested only 1.5#, but we continued, adding in more seed-stock, and planted 46# for 2003, (90’ large, 180’ small). At that point I was dividing into 3 planting sizes: small (<1”, 30-60 bulbs/pound); medium (1-1.5”, 16-22 bulbs/pound); and larges (>1.5”, 7-8 bulbs/pound). For 2004, I planned to plant large:small in a 1:2 ratio by area, to get enough small and medium onions to plant the same area the next year, and to get lots to eat as well. But the 2003 harvest had a high amount of large onions, and I decided to plant them all, increasing to 540’. We expanded to plant 720’, in a large:small ratio of 1:3 by area (i.e. 180’ large, 540’ small). This gives us enough smalls to plant for the next year, and plenty of larges and eaters. Someone growing for maximum seed-stock would probably want to plant a higher ratio of large ones, in order to get more smalls. Instead of weighing all the onions, I now know I need to save 3 racks (probably 65#, 450 bulbs) of larges (1.5-2.0”) and 5 racks (probably 75#, 2100 bulbs) of smalls (<1.5”) for planting next year’s crop. This allows a margin for decay. The small ones really are very stable, it’s the larger ones that are more prone to sprouting, so I pull those out whenever I pass by. 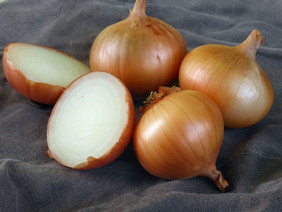 For cured dormant onions it is very important to avoid the 45°F-55°F (7°C-13°C) range, because that’s when they sprout. For storage, onions and garlic do best with a humidity of 60%-70%. Refrigerators are usually more humid than ideal. If you have a barn with the right temperatures, that will work better for long-term storage. In our climate, with a long period in the danger zone temperatures, we keep alliums in the warmer storage range in a barn, shed or basement until ambient temperatures drop close to 55ºF, and then move them to a refrigerated cooler at 32°F -41°F (0-5°C) 95-100% humidity. 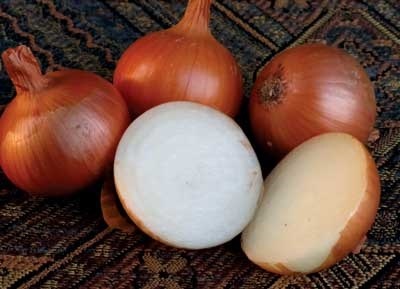 If at all possible, do not store onions with fruits, including squash, as these exude ethylene which promotes sprouting. Walla Walla large non-storage onion. If you have been wild-crafting ramps (more on that in March), this is time to pay the piper. Collect seed and scatter it over the patches you dug from. Or collect seed to grow in woodlands at home – without of course, taking too many away from a place they could grow naturally. See the article in Modern Farmer. The seeds scattered in zones 3-7 in early fall, take 6 to 18 months to germinate, and the plants take 5-7 years to grow to harvestable size. 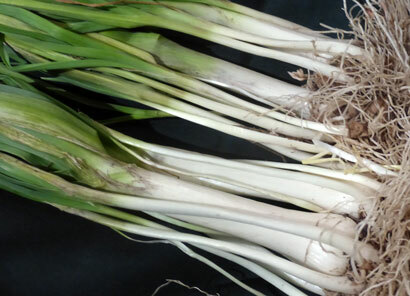 Thus it’s easy to see how wild ramps have been seriously over-harvested. 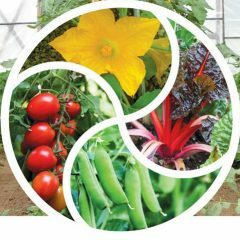 Buy seeds year-round and bulblets in late winter at rampfarm.com and mountaingardensherbs.com. 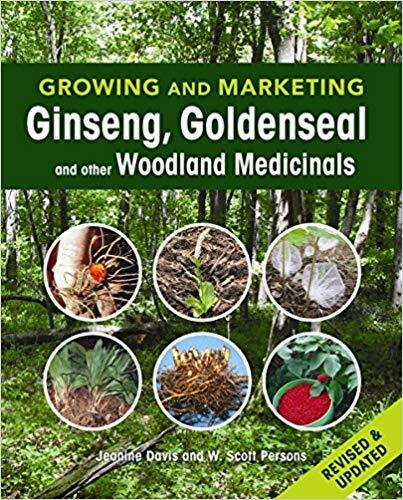 Read more in Growing and Marketing Ginseng, Goldenseal and Other Woodland Medicinals by W. Scott Person and Jeanine Davis of North Carolina.